Like many folks on the Shore, we love a garden, be it small or large. But it seems like there is never enough time to plan and plant in the middle of everything else that is always going on. Our entire garden, this year and most other years, got put in late. Because the Eastern Shore of Virginia has a very moderate climate and Northampton County, at its southern tip, has exceptionally sandy loam soils, a lot of folks here plant a wide variety of vegetables — beginning with cool type crops in early Spring, ending with fall cabbage, collards and broccoli, etc. which can winter over in the ground. Because of the Shore’s moderate climate, we can have a garden for all seasons and who doesn’t like something fresh-picked all year round ? We usually get organized too late for early lettuce, etc. and this year we were later than usual. So now, almost August, it’s too hot for the swiss chard which is finally the right size, what’s left of it. But the okra plants are coming right on along but are still too puny to really be cranking out the amount we need to give some away to friends who like it but don’t grow it and to fix a “good mess” for ourselves. I’m originally from the North so it took me a while to get used to the fact that on Virginia’s Eastern Shore, a large pot or pan of certain foods is usually referred to as ” a mess” i.e., for dinner tonight I’m going to cook a mess of greens (collards, kale, mustards, etc) , or a mess of beans ( green, lima, butter, etc.) or, of course, a mess of okra. If you have never grown okra, it is a very striking plant — we always grow the purple variety, which looks even more dramatic. (The stalks are a deep, deep purple and the pods are purple as well, until they are cooked, when they turn green like their cousins.) About 5 to 6 feet tall at maturity, okra really stands out in a garden, towering over everybody else, master of its domain. The okra pods are a little prickly and, for simplicity, I always cut them off with a scissors, leaving a short stem at the end because for us, okra is a finger food. Of course, once you harvest the okra, for the very best flavor, it should be cooked within a day. Washing okra is a pain because circling the top of each pod are little floppy things ( reminds me of hangnails) which need to be removed while washing, a bit time-consuming. There are of course a myriad of ways to cook okra but only one way is acceptable to me. I’m not big on slime and that includes slightly slimy okra. In my opinion, when okra is cooked in the more traditional ways, stewed with tomatoes for example or added to a gumbo, it gets a bit slimy. Not for me, not at all ! But I do love the flavor of fresh okra. So, to keep the flavor and cut the slime, I fry it. Now a lot of people cut okra into pieces, roll it in cornmeal and deep- fry it and I’ve eaten some mighty good deep- fried okra, crispy-crunchy. But, as Vinnie from Brooklyn asked the Alabama short order cook just as he was about to fry Vinnie’s eggs in a lake of Crisco, “Youse guys down here ever heard of the on-going cholesterol problem in the country ? ” (from one of my favorite comic movies, “My Cousin Vinnie”, starring Joe Pesci in his best performance, ever ). Unfortunately (or fortunately, however ones sees it), we have heard of the on-going cholesterol problem at my house so we don’t usually deep- fry, not even to get crispy-crunchy cornmeal- battered okra. Which leaves my favorite way to fix okra. Heat a little olive oil in a saute pan till hot, throw in the okra and pan fry, uncovered, over medium heat. It’s important to keep turning frequently until done, which takes a while . ” Done” is when it has turned almost black, (not burned, just looking black, trust me here), black and shriveled looking. Because that is the secret– the dry heat dehydrates the okra, evaporating the slimy feel, leaving only delicious, nutritious okra which you then devour, picking up each pod by the little stem you left when harvesting it. Thank heavens the okra is doing fine because just writing this blog post made me want to cook up a mess for dinner tonight. “Those trees” are our brightly colored crape myrtles. 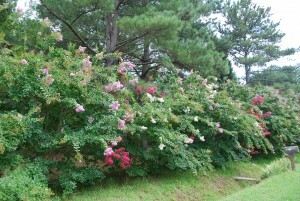 Coming into bloom when all the prima donnas flowers of Spring and the more common folk like the plentiful daffodils, azaleas and irises have long faded away, crape myrtle trees bring intense splashes of summer color up and down the Shore. In Northampton County, large portions of Route 13 are lined with these beauties, mostly the pinks and whites, but with lavenders and deep rose as well. Primarily a tree of the south, they don’t do well in colder climates, but here on the Eastern Shore of Virginia, crape myrtles are the beloved blooming beauties of July– and August, and, if we are lucky, a bit of September as well. If you visit a local nursery usually you can select from one of eleven vibrant colors, ranging from just about every hue from very light pink to a deep, deep rose, plus red and lavander. The “Natchez” variety, which sports large snow white blossoms, makes up for its lack of splashy color by having the most deeply hued bark, almost a burnt sienna hue. The bark and shape of these trees is really quite unusual — normally a light to deep tan, the bark is completely smooth– when you look at the bark you feel the urge to touch it, just to see if it feels as smooth as it looks. In the autumn, as the leaves start falling, the colors of the bark become more accentuated, bringing a different kind of beauty to this singular tree. ( I should mention here that we have a wonderfully moderate but 4 season climate here on the Eastern Shore. Springs and autumns are long and very, very pleasant. The cold part of winter is very short, primarily the month of January, we seldom have snow, virtually never have ice, farmers here start plowing near the end of February. July and August are our only hot months and are absent the soaring humidity so prevalent in our Carolina neighbors.) And as it gets older, the crape myrtle becomes very slightly twisted and gnarled, adding even more character to an already amazing tree. But one of the best things about crape myrtles is this— they are so easy to grow ! Anyone can do it ! Even me ! Just stick them in the ground, make sure they have plenty of water in the early months and voila ! they just keep on growing. No fuss, no muss, no bother. They are a lot like our holly trees in that respect, once they take hold they are virtually indestructible, you very nearly can’t kill them even when you want to ! So up and down the Eastern Shore, the hardy crape myrtle tree is an important component for brilliant summer color in any homeowner’s landscaping plan. My personal favorite is to see them lining driveways, especially long, winding driveways. They look like colorful sentries, an immobile honor guard, blushing red, white and pink all the way home, these beloved blooming beauties of July, Virginia Eastern Shore’s spectacular crape myrtle trees. 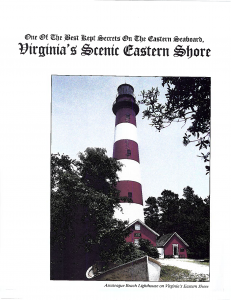 Having lived on the Eastern Shore of Virginia for nearly 25 years (how time does fly), I probably have been to the little coastal town of Cape Charles several thousand times, at least, for shopping, doctor appointments, lunches or dinners, meetings at our real estate office in the Cape Charles historic commercial district, etc. , etc. But I had never actually spent a night in Cape Charles until a friend of ours, who owns one of the “grand dame” homes overlooking the beach there, invited us to spend the Fourth of July week-end at his house. We had a wonderful time and based on that experience I’ve decided that it’s really impossible to fully appreciate the unique Cape Charles small coastal town atmosphere/lifestyle until one has spent an entire day and night there. Our evening kicked off with coffee and dessert ( a delicious southern style coconut cake with lemon curd filling and coconut icing, especially ordered from the Cape Charles Coffee House, www.capecharlescoffeehouse.com , baked by the inimitable Roberta) served on the wide front porch overlooking the Chesapeake Bay and the town beach. The sun was just beginning to set, streaks of pinks and violets painted across the sky and waters below. A salty sea breeze picked up, the air had cooled considerably from the hot point of the day. And then the waterfront just came alive with quiet activity– dogs and owners sauntering down the boardwalk, toddlers being pushed along in strollers, bicyclers singly or in groups of 2 or 3 enjoying the soft summer breezes, joggers and walkers ( my speed entirely) out to enjoy the sunset, one or two kids on skateboards trying to do a few flips, folks with fishing poles walking down to try their luck on the new Cape Charles fishing pier which is beautifully illuminated at night. Boats launched from the Cape Charles harbour gliding by on the way out to fish the hot spots after dark, sailboats slipping back into the marina for the night. We love “people watching” and with a backdrop of sunsets, beach, boats, lapping waves , water and seabirds calling overhead — it was great. What was also fun was watching the golf carts, many decorated or painted special colors, cruising slowly down the street, out for a evening ride around the town. ( Uniquely, Cape Charles is one of the few towns in Virginia where golf carts are street legal and many residents use these colorful and eco-friendly vehicles as their main in-town transportation. ) Out on the beach a few kite surfers were taking advantage of some the stronger winds that blow at sunset along with beachcombers and a few die-hard kids finishing up a sand castle. Everything worked in such harmony, everyone just having fun , totally relaxed, lots of laughter carried on the wind– we stayed out on the porch past dark, just enjoying for ourselves the enjoyment of others on a beautiful, soft summer’s evening in Cape Charles. And I discovered for myself a part of why people who live in Cape Charles love it there. 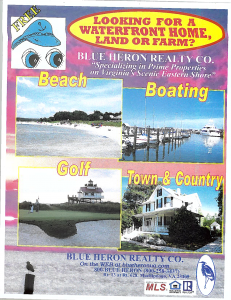 Many people who stop into our real estate office on Rt.13 in Machipongo, Virginia for a copy of the Blue Heron Realty Co’s. 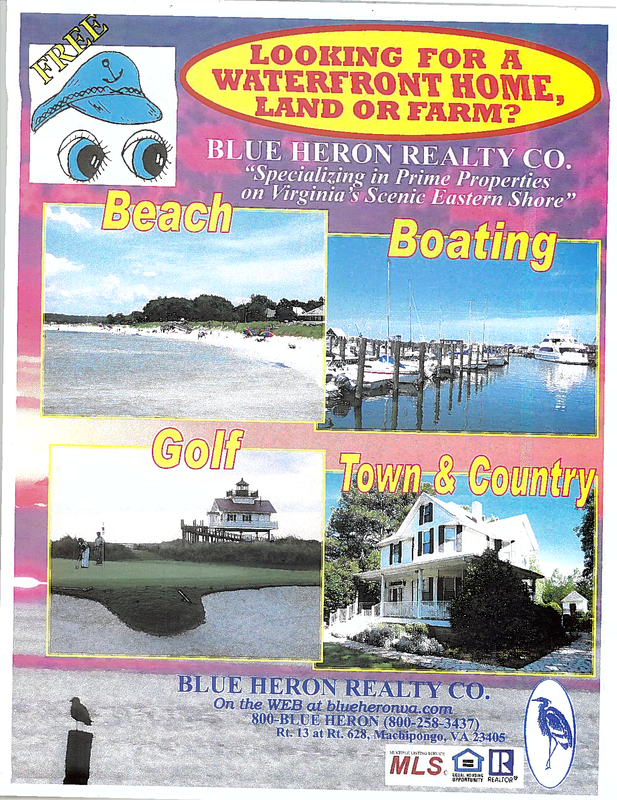 free waterfront catalogue (request a copy at 757-678-5200 or at www.blueheronva.com ) have never really thought about buying a piece of land and actually hiring a general contractor to build their dream home instead of just buying an existing home. Certainly many have toured builder’s model homes , this being the most common way to acquire a brand new home, complete with your own paint colors and carpet selections, etc. But very few people live in areas where it is possible to find a nice lot or large parcel of land that hasn’t been taken by builders for homes they will construct for their own inventory. Indeed, in other areas of the country neighborhoods are generally developed by builders with the requirement that if you purchase a lot in that neighborhood then you must use that specific builder for your home construction. Indeed, many even have a specific time frame in which your home construction must begin. Things are pleasantly different here on Virginia’s Eastern Shore. Except for a large golf community which allows only their own authorized builders , the rest of the Eastern Shore is a series of small, intimate neighborhoods, usually centered around a water amenity offering a real coastal lifestyle to those who live here. These neighborhoods started off with the sale of the lots to individuals who wanted to secure a lot they loved with a plan to have a custom house built on their lot in the future when they were ready for a leisure or full-time home here. No time frame was imposed for beginning construction. Lots of folks have purchased land here for a leisure, retirement or full-time home that might not be constructed for years into the future but when they found the perfect lot they wanted to secure it. Many buyers feel that this is the best of both worlds– find the perfect lot and then have plenty of time to plan for the exact features they wanted to incorporate in their future home. That tradition still continues today — great opportunities available to purchase a beautiful waterfront or water access lot now and build only when ready. And because most of our builders here are custom home builders, ready to build individual homes on lots owned by their customers, (as contrasted to “spec” builders who buy lots for their building company to build a home for resale) the Eastern Shore of Virginia continues to have that unusual commodity mostly unavailable elsewhere. Here you can easily purchase an individual lot, large and small, waterfront or water-access , in-town or in the country, beach, boating or golf oriented, for sale at today’s attractive prices to those who want the best of both worlds — the perfect lot for construction of their dream custom home. And best of all, unlike mercurial stocks and bonds ( think Enron, Lehman Brothers or BP ), your land will always be here, waiting for you. Build on it now or much later, keep it for your estate or hold it for investment and resell it, whatever your goals, land is truly rock solid (no pun intended) and a place where you can invest not only with your wallet but with your heart. Inevitably, the caller would next ask for a description of the real estate we did have available. I’d talk about the various options — consider a beautiful home on a saltwater inlet, built on a three acres, with a dock in the back yard, just waiting for the new owner’s boat to be berthed along side. Or a 10 acre waterfront lot ready for a custom home, located down a quiet country road, far from the madding crowd. Possibly a couple acres right on the beach in a tiny beachfront neighborhood, more expensive than on an inlet but drop-dead gorgeous. Maybe a gracious home with a large, shady porch in one of our little towns, with narrow sidewalks and big oak trees. Or possibly a farm– not many available but we do have a 80 acre beauty, perfect soils for cultivation, with a little woodland too. But we have no condos today. At any rate an idea was born – – my husband and I would write a little book that we could sell or loan to people who were considering making a trip to the Shore to look for property, a book they could read before actually coming to look at property, a book with lots of photos that would help detail what the Shore was and more importantly, what it was not. That way customers could save time (and we could save time too) by deciding , in their own living rooms, if they were likely to find the Shore too rural or whether they would find it to be just perfect. With the help of Dave Temens, friend, pilot, aerial and ground photographer par excellence, now deceased, over the period of about a year and a half we wrote, and in 1989 published, “One Of The Best Kept Secrets On The Eastern Seaboard : Virginia’s Eastern Shore.” This little book offered a look at what it would be like to live on the Eastern Shore as it was then. Although it was sold in local shops, our primary purpose was to sell it or lend it free (just pay round-trip postage ) to folks from out of the area who wanted to consider purchasing property on the Shore. Over the course of the 1990’s we received literally hundreds and hundreds of letters which basically expressed two very divergent sentiments — either “Thanks, we think we will love your area and can’t wait to make the trip” or “Thanks so much for the book, it helped us decide not to make a trip down as we think that the Eastern Shore just would not be for us.” And so the book did its job, helping folks evaluate the pros and cons of our area before taking the time and money to drive or fly here to look at property. Fast forwarding to the present, ( skipping entirely over how and when we got two shopping centers, two arts centers, an expanded full-service hospital, the renaissance of the little beachfront town of Cape Charles into a thriving art mecca even including a theatre company, a state of the art marina, various fine dining establishments, a lovely boutique hotel and the construction of a fabulous gated Bayfront golf community, top rated nationwide, featuring Palmer and Nicklaus Signature golf courses ), we return to the question of condos. Want a condo ? Yes, we can help you ! Welcome to our new wide wonderful world of condos, but with a twist. 90% of Northampton County is still the same beautiful rural area, mostly family farms interspersed by small water-oriented neighborhoods of single family homes and lots averaging 1-3 acres. But in and around Cape Charles, with its many amenities, we have condos and duplexes too, in different styles, sizes, prices and locations. Spacious new condos with beach and boating access, condos on golf fairways and condos in the historic district of Cape Charles as a some of the larger brick buildings overlooking the harbor were renovated into gorgeous condos, commercial downstairs, lovely waterview residences upstairs, etc., etc.. 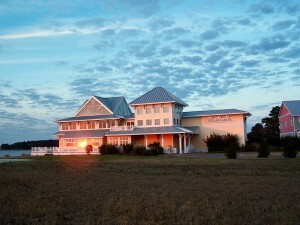 So now, when folks call us for real estate information, we can still offer the lovely waterfront home on 2 acres, or a fabulous beachfront lot, definitely gracious homes in our little towns and we still have a few 5 to 20 acre farmettes or larger farms plus the new golf resort homes and lots. But now, now when we are asked, do you have condos ?? ?, we are pleased to be able to say YES. Yes indeed, welcome to the new, wide and wonderful world of Eastern Shore condos. Like most of the residents of Virginia’s Eastern Shore, my daughter has dogs that love the water . Although most water loving dogs in our area are either labs, ( yellow, chocolate or black) or the famous Chesapeake Bay retrievers, my daughter has two Newfoundlands, a sweet, sweet breed. Reddish brown rather than the traditional Newfy black, her dogs are an endless source of amusement for anyone who sees them playing together, the gentle giant and the feisty ball of Newfy puppy fluff. Pumpkin, who will be two years old next month, is nearly the size of a small pony. HoneyBelle, Honey for short, now five months old, is less than a quarter of Pumpkin’s size. 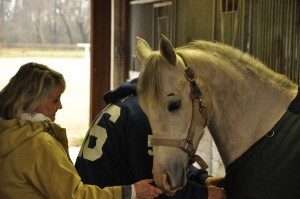 But when they wrestle, as they love to do, Pumpkin is so sweet and patient with her, the smart money is on Honey to win. Aside from taking them to the vet where their official weights are duly noted in their records, my daughter’s favorite way of measuring them is with frogs. Which takes a bit of explanation, obviously. Out in the yard, beneath a large Bradford pear tree, side by side, sit two yard ornaments, large smiling frogs, standing comically on their hind legs, front legs akimbo, fingers widely splayed ( can you call them fingers ?). When Pumpkin was a small pup, just 10 weeks old, she loved smelling around those silly frogs. One thing led to another and the idea to have her sit beside the frogs and have her picture taken posing with them was born. In the first picture taken, the frogs towered over Pumpkin. And then every month or so for about the first year, as Pumpkin continued to have her picture taken with the frogs, bit by bit she came abreast and then finally towered over them. And now it’s Honey’s turn to be measured with frogs, usually with Pumpkin by her side, my husband and I the official leash holders. Already she is getting close the high water mark but the towering time is months off. As for future measuring — Honey won’t mind, she loves smelling around that tree and those silly frogs, just like Pumpkin. I love having a summer dinner at Aqua’s at sunset, it’s as magical as an old Cole Porter tune. On a balmy summer’s eve , at a table on the deck, savoring the de-licious food as the glowing sun nears the horizon truly is De-Lovely. Aqua’s, located right on the Chesapeake Bay at the southern tip of the Shore in Cape Charles, is one of a number of waterfront restaurants on the Eastern Shore of Virginia including the very casual Pelican Pub right on the beach near Townsend, Island House in Watchapreague, Stella’s at Willis Wharf, Wright’s near Atlantic and Mallard’s in Onancock , to name a few, but it is my very favorite. And it seems like my food tastes better accompanied by “watching”– watching the sailboats drift by, observing the seabirds, ready for their dinner too, swooping down to catch it, seeing a couple of kayakers leisurely paddle towards the shore and, as the twilight fades, seeing the glow and twinklings in reds and greens of the channel markers out in the Bay , calling boaters home for the night. It goes without saying that the food is delicious. Although I don’t agree, my husband and youngest son both claim that I am very picky in restaurants. But what they call “picky” I call an expectation of “getting it right” and at Aqua’s they really do get it right almost every time. My husband is very fond of the appetizer they call “crab lollipops” which are served with an excellent chipolte aioli. Because I don’t often prepare fish at home, he usually selects the seared tuna, the blackened mahi-mahi or the mixed seafood grill for his entree. I always peruse the entire menu, consider various selections carefully and then, since I seldom deep fry at home either, usually select the fried jumbo shrimp. They come dressed in a feather light batter, sweet and succulent, accompanied by a delicious coconut jasmine rice. Although we usually don’t order dessert, every once in a while we will indulge in the smooth and creamy chocolate chip cheesecake, a house specialty, which is indeed quite special. Aqua bills itself as “concentrating on fresh regional cuisine” and as a restaurant “you’ll want to come back to over and over again.” We agree completely. For a delicious meal at sunset, no place is more De-lightful, De-licious or De-Lovely than Aqua’s. Dogs and museums are not usually thought of as being at all compatible. But that kind of thinking is sooo yesterday now that Laura Vaughan, the director of the Barrier Island Center, ( BIC to those who know it well ) , is making BIC the de rigueur destination for Eastern Shore doggy field trips. Saturday was the first in a series of “field trips for dogs” to be held under the tall, shady oaks at the Center. Under the expert direction of Beth Ann Sabo, a certified local dog trainer, Saturday morning’s experience started out a little like an old time country social but with kibble treats and pans of water instead of picnic baskets and lemonade ! It was a “doggy socialization” event and my daughter brought her Newfie puppy, Honey, for a little “meet and greet” with the 10 other dogs in attendance. As anyone knows who has recently gotten a puppy and has purchased a “how-to” book , the modern standard for socializing a puppy is to make sure it is equally at home around a variety of dogs as well as people. The mantra for this is “100 dogs and 100 people in the first 100 days” because the first 3 or 4 months of a dog’s life and the experiences it has during those 3 or 4 months imprint the dog for life. Basically the experiences and training a dog receives during that time determine whether it will be a friendly, timid or aggressive dog in its relations to both people and to other dogs. Beth Ann says that most dogs that are sent to the SPCA are placed there before they are two years old, primarily as a result of a lack of early proper socialization and training by their owners, who then get rid of the dog because of resulting bad behaviors. Having once had a dog for 12 years who loved all humans but who never met a dog she didn’t hate, (which was, of course, a real problem), my daughter is working hard to see that Honey does get properly socialized to dogs as well as people. She jumped at the opporunity to bring Honey to the BIC party to meet puppies of different breeds and temperaments. So the dogs introduced themselves the old fashioned doggie way, sniffing, licking, sniffing, licking and then some more sniffing. And no ordinary “Spot” or “Rover” names for this crowd — instead Honey the Newfoundland met Hilda the English Bulldog, Frolic the Norwich Terrier, Ginger the Golden Retriever, Trey the Beagle and Rupert the Italian Greyhound, to name just some in the group. Beth Ann remarked as she was about to get down to the “work” of the morning that she had hoped for a variety of breeds for this first session but could not have imagined such an eclectic mix as a Newfoundland and an Italian Greyhound. Then dogs and owners settled into a few tasks; coming when called by name to improve focus and response; owners switching dogs with other owners to improve socialization with unfamiliar persons; sitting, greeting and then passing by another dog ( which, as anyone who has ever watched a Cesar Millan show knows, can be a bit dicy). 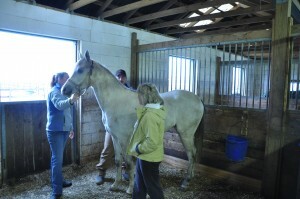 The final lesson involved having all the owners stand in a long line, their dogs by their sides. Then, one by one, Beth Ann came down the line to hold the leash so the owner could walk about 20 feet out into the clearing and call their dog to come to them. Honey was near the end of the line. Being a hot July day and she being a furry Newfoundland, by now Honey was hot and a bit tired. While all the other dogs were sitting and paying attention, she was sprawled out, completely relaxed, just taking it all in. So, when my daughter strode out and confidently called her name , Honey just raised her head and gave a look which clearly said, in her most gracious Southern Dogese, “Girl, I know you’ve got to be kidding. You’ve had me running around for an hour now, my feet are killing me and I’m taking a load off. Definately I’m not running out into the hot sun for some measly treat. ” (If she were a Bronx dog she would have yelled ” Forgeddabout it !” which would have totally said it all.) Well, I had just resigned myself to the idea that Honey was going to be the only dog in the entire class to fail “Run to Your Owner” when up she jumped and out she ran. And she got the measly treat– plus a lot of praise from her very nearly embarrassed owner ! Will They Come When You Call ? The hour was up, doggies were ready to hit the lunch trail, as were owners. We stayed to talk to Beth Ann a bit and learned that she gives private training lessons for dogs as well as the group sessions. She will even travel to an owner’s home to work with a dog in its normal environment. (For anyone who is interested, learn about her certifications and contact Beth Ann through her website– www.easternshoredog.com ). After that we stayed a little bit longer to talk to Laura Vaughan about some of the great work the Barrier Island Center (www.barrierislandcenter.com) is doing to educate and inspire children here on the Shore (which in itself will be a future blog post). Laura invited all of us inside, including Honey, who promptly found an air conditioning register and plopped herself right down on it, perfectly at home. Laura’s philosophy is that people who love the Center also usually love dogs. So, the more the merrier. And that’s how Honey the Newfie became the first dog in our family to tour a real live museum. As I often say, only on the Eastern Shore ! Our year as defined in fruits: Fall is for apples and apple cider– crunchy, crisp Pink Lady’s that we love to drive up into the mountains near Charlottesville, Virginia to purchase at Carter Mountain Orchard, along with with their fresh pressed cider and the apple cider donuts, none better, my husband’s favorite . ( www.cartermountainorchard.com ) Winter is for citrus– tangy, juicy Honeybelle variety oranges, ripening in January, fragile so unavailable in most grocery stores, usually purchased from The Orange Ring in Orlando, Florida, three bushels of which we tote to the airport and ship back to the Eastern Shore with our luggage to share with family and friends. Spring is for the fat red Eastern Shore strawberries, grown by various local farmers and perfect for shortcakes and strawberry ice cream, homemade. But summer…. well, plain and simple, summer is for peaches. By peaches I don’t mean the dry as dust, hard as rocks, green as gourds specimens that are the usual offerings at grocery stores, hydrocooled and ready to rot before they ripen. No , by peaches I mean the beautiful rosy, orangy globes that come ripe from the tree, warm from the sun, with an aroma straight from Heaven. And when you peel these peaches, juices just flow into the bowl as you slice them. It’s hard for me to describe flavors but let me just say that a slice of such a peach, soft and mellow, is like a burst of luscious perfume spreading through the mouth, a true epicurean delight. Like so many good things, peaches such as this are difficult to come by. They are not available in grocery stores because a tree ripened peach cannot withstand much handling. Being soft, it bruises easily. No, tree ripened peaches are only available from farm markets and the very best ones are obtained straight from a local farm orchard. Which is why every summer I find myself waiting for peaches. Come the middle of June, when those old hydrocooled fakes appear in the grocery stores, I start thinking “wow, only 4 more weeks”, then “only 2 more weeks” and finally, in the middle of July, ” They must be ready. ” Which is why today I made it a top priority on my way home to stop by the Pickett’s Harbor Farm Market to get my first 1/2 bushel of their 2010 season gorgeous tree ripened peaches. And I was not disappointed– they were beautiful, large, ripe and juicy. Ready to be sliced over ice cream, added to Cherrios, made into pies, cobblers and brandied peaches. And if the energy is there, chutney and preserves. And the great part is that they will just keep on coming, a new variety every 10 days until the first part of September, with exotic names like “Blushing Star”, “Paul Friday # 2” , “Klondike”, “Sentry” and “Fire Star “. Picked daily, straight from Tammy and W.T. Nottingham’s amazing peach orchard located on Pickett’s Harbor Drive right here on Virginia’s Eastern Shore, no need for a trip to Charlottesville or Orlando, thank-you very much. So between now and September, my family and I will eat a surfeit of peaches because once they’re gone, it’s back once more to waiting for peaches. I thought that after thirty years of being asked by my only son “So, what would you like for Christmas this year ?” or “If I give you money would it be better if you chose your own Christmas present ?” that something was really rather strange this past year. In the weeks leading up to the big day, not a word did he say, not one question did he ask about my Christmas gift preferences. Knowing that he usually felt a lot of uncertainty when shopping for my present I assumed that he had decided to skip the shopping part entirely and just slip money into a Xmas stocking. I should mention that I, on the other hand, love to shop for Christmas. Trying to decide on a really meaningful gift for family and friends, one I think they will truly enjoy, is a passion with me. Since Virginia’s Eastern Shore is home to so many artists and artisans, I always scour the Shore for some interesting art type gifts before I shift into what I think of as “high gear”. “High gear” is my annual Christmas shopping pilgrimage with a friend or two, usually to Washington DC, sometimes to New York. One of the things I love about living on the Eastern Shore of Virginia is how easy it is to get to interesting nearby areas such as Williamsburg, Richmond, Washington , Annapolis, Charlottesville, etc., as well as points north including Manhattan, Cape May, maybe even that den of iniquity, Atlantic City. This past year we made the 4 hour drive from the Eastern Shore to Washington, laser focused on unearthing some great deals over the next few days at Tyson’s Corner and treating ourselves to lunch at Neiman Marcus. Splurging by staying at the Ritz , we parked ourselves by the cozy fireplace in the evenings, toasting the season with hot toddys and cold champagne. So much fun, so little time and all too soon we were on our way home. Still no gift questions or comments from my son. Then, on Christmas Eve, a festive dinner and presents after. And I must admit, after all of the presents were opened and he didn’t have a box or even an envelope for me that I felt rather disappointed. About 11 pm he kissed me goodby, saying that he had to leave to meet some friends. No “sorry I couldn’t find anything I thought you would really like”, no “please use this to buy something nice”. Just “Merry Christmas, Mom”. At that point my first thought was that I should have had more than one child. Although I am a firm believer that it is better to give than to receive, truth be told, I was feeling rather disappointed. Then, on Christmas morning I received a call asking if we would possibly have the time after Christmas lunch to join him at a friend’s big waterfront horse farm south of Cape Charles. We would and we did. And when I got there he said “Come look at this.” We walked into the barn and there in a stall was a beautiful grey Arabian colt, dressed in a red halter with a red Christmas bow in his mane. 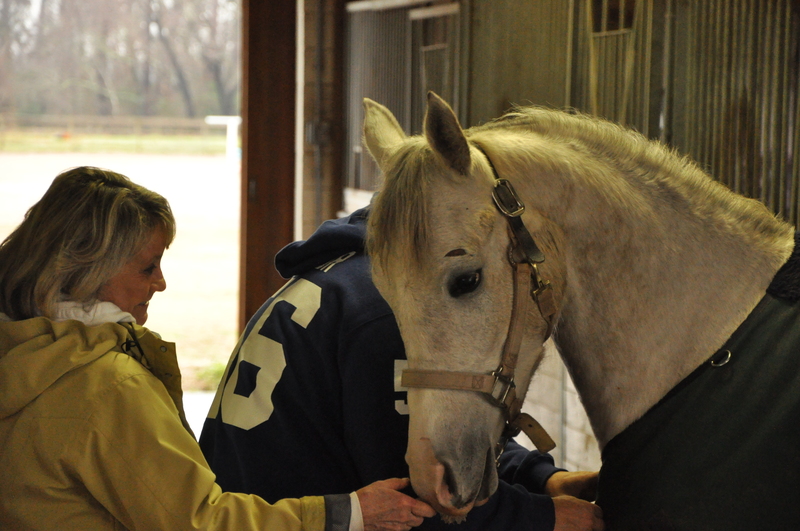 After 20 years since I last had a horse I was looking into the eyes of one of my sweetest Christmas presents ever… Wiley, my Christmas horse. 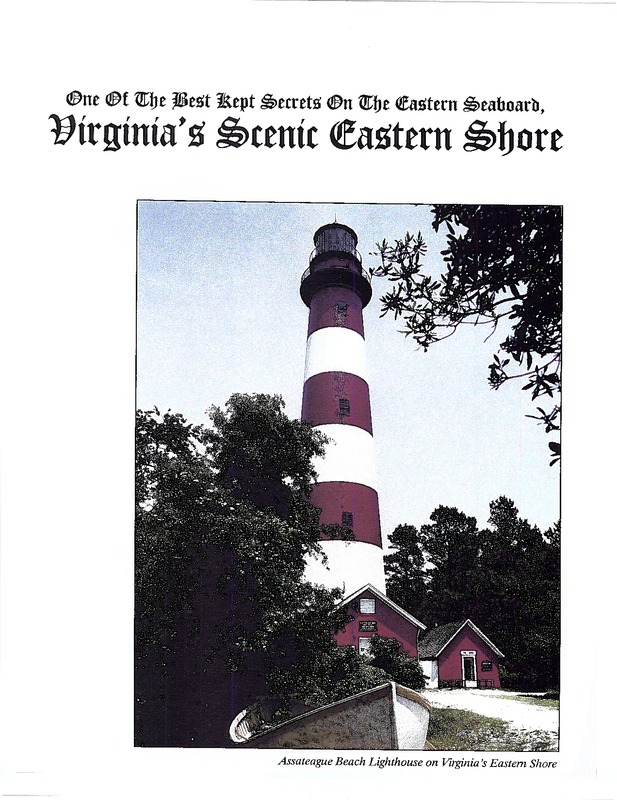 You are currently browsing the Life and Real Estate on the Eastern Shore of Virginia blog archives for July, 2010.